This year, the 16th International Conference for Mobile and Ubiquitous Multimedia (MUM 2017) was held at the University of Stuttgart. Researchers from all around the world met from November 26th to 29th to present and discuss their latest work. Its single track program featured presentations about several topics from the cutting edge of research in Human Computer Interaction, along an art exposition, a Doctoral Consortium, posters sessions, workshops and tutorials. The conference was organised by Kaisa Väänänen, from the Tampere University of Technology, and Niels Henze and Paweł Woźniak, from the University of Stuttgart, and supported by the Association for Computing Machinery (ACM), the Special Interest Group on Computer-Human Interaction (SIGCHI) and the University of Stuttgart. The presented research focused on interactive multimedia, encompassing very diverse topics such as smart calendars, the use of drones for guiding pedestrians, or inferring the diet of people from their Instagram posts. The opening keynote was an inspiring talk on change from Shengdong Zhao, from the School of Computingat the National University of Singapore. His main topic was the unavoidability of transformational change in technology and HCI, and how this will affect our lifestyles in the coming years. The closing keynote was a both deeply critical and very humorous lecture by Dirk van den Boom, a German science-fiction author, extraordinary professor of political science at the University of Muenster, consultant and journalist. His talk focused on how globalisation and communications propitiate an ideal medium for the proliferation of fear and ignorance, and how humour is the only effective tool to fight extremism and hate speech. 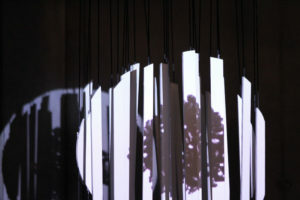 The art track – Chaos/Order//Chaos, an interactive media sculpture. 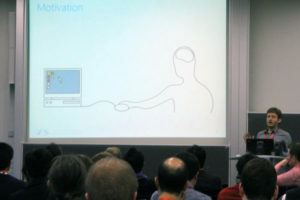 Francisco Kiss from the University of Stuttgart, presenting the “Design and Evaluation of a Computer-Actuated Mouse”.